Although all the Olympus PEN cameras use the same 12.3 megapixel sensor, incremental improvements to image quality have been made through the models over the last three years. In particular, a weaker anti-aliasing filter was introduced with the third model, the E-PL1, and maintained through subsequent iterations (E-PL2, E-PL3, E-PM1, E-P3). Here I will test the E-PL2 (released January 2011) against the E-P2 (released November 2009) in order to see if there is a discernible improvement in IQ. I will provide the usual disclaimer that I am no equipment tester; I have no special gear, charts, calibration equipment, etc. Most of the time I simply take "normal" photos and see how they turn out. Every so often I resort to shots under more controlled situations, and that's what I will share with you today. Likely others have performed this same exercise before, but I like to prove things to myself! I also wish to emphasise that small changes in image quality will not make you (or me!) a better photographer. This test is more or less a matter of curiosity. That said, I will now succumb to the temptation of pixel peeping. 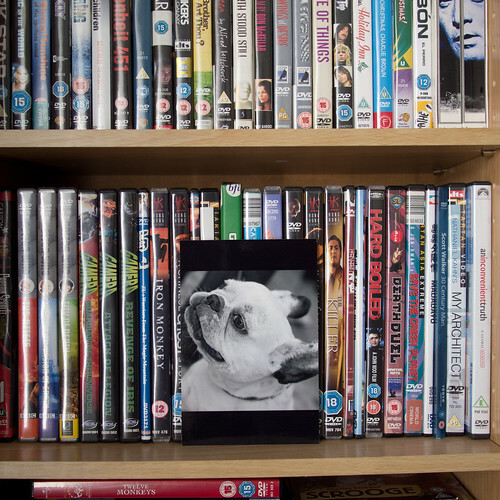 Here's the boring shot I took of our DVD shelf, unremarkable unless you have a perverse interest in our viewing habits. I used a tripod and timed release to ensure that camera movement was not a factor. Light was from a window to the left, as you can tell from the highlights. I positioned a black and white photo so I had an area of greater detail near the centre of the image. The lens is the universally praised Panasonic Lumix G Vario 20mm f/1.7 ASPH, set to f/2.8, its optimal aperture. I used auto-focus, which is very accurate in ample light (though rather slow). I had all special settings on the camera, including noise reduction, etc. set off. The image setting was "natural" and exposure mode Aperture-priority. All this shouldn't matter, since I shot RAW and cooked the files with all enhancements off, using Adobe Camera RAW. I note that real-world shots would look better than these examples, since some sharpening of RAW images is advantageous, and is indeed a part of my standard workflow. I kept the camera white balance setting on automatic and was intrigued to notice a distinct difference in the colour balance of the results. Since the area of interest is a black and white photo, I reduced the files to monochrome. After all, this is not a test of colour reproduction, which I find to be completely usable and mostly accurate, small discrepancies notwithstanding. This done, I took a shot at each whole stop ISO setting, doing the same for each camera. The following image shows a test strip of 100% crops. Please click through to Flickr in order to access the full-sized images. The result? The E-PL2 is indeed sharper, as if a slight haze had been removed from the E-P2 images. And while more detail generally shows up more noise in the bargain, the E-PL2 shots appear to have less obtrusive noise, without any obvious "smoothing". I very much dislike in-camera noise reduction that produces artefacts and which I cannot turn off. That's one reason I like Pentax processing. And neither do I see anything in this Olympus to dislike. I notice that the E-PL2 seems to be exposing slightly brighter than its counterpart. In this case at least, that seems to be more accurate, and might minimise shadow noise. Finally, I will go back to my comment about white balance and note that the E-PL2 was also the most accurate in that regard. The E-P2 had a blue tinge. This seems to be a four-way win for the later camera. Although each factor is small enough, if you are a stickler for getting the utmost from your camera you should scratch the E-P1 and E-P2 off your list. I am pleased to see that incremental improvements do sneak out the door with models that are otherwise largely driven by the need to market a new product or three every retail cycle. However, back to reality. For most casual shooters these tiny improvements are irrelevant. I would instead recommend purchasing a model based on the criteria in my previous article.